AXEON HF5-4040 Reverse Osmosis Membranes are one of the industries most reliable and highest performing reverse osmosis elements. The HF5-4040 RO membrane elements are available in all standard commercial sizes, feature a protective tape wound exterior, and are 100% vacuum integrity tested. 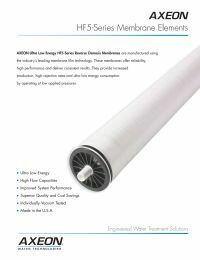 The polyamide thin-film used in the AXEON HF5 Series membranes is manufactured by a major US membrane film manufacturer.